The Matanuska-Susitna Borough on Jan. 25 added 145 pages to its ongoing argument that Port MacKenzie would be a better location than Nikiski for the Alaska LNG project’s natural gas liquefaction plant and marine terminal. The borough, which owns the property across Knik Arm from Anchorage, added additional comments, maps, charts and photos to the docket at the Federal Energy Regulatory Commission, which is scheduled to release its draft environmental review of the Alaska LNG proposal sometime in February. The borough has long been critical of the site selection, Port MacKenzie alternative analysis and answers provided by the Alaska Gasline Development Corp., the state-funded corporation that is leading the proposed $43 billion project. “Unfortunately, the approach to analyzing the alternatives employed by AGDC in its responses confuses, rather than clarifies, the differences between the alternatives of Nikiski and Port MacKenzie, and its responses could result in an inadequate analysis of alternatives to AGDC’s proposed action,” the borough said in its latest filing with FERC. The borough’s Jan. 25 filing was in response to the state’s answers turned in at FERC on Nov. 20 after federal regulators had asked AGDC for further analysis of Port MacKenzie. The borough a year ago complained to federal regulators that AGDC may have violated the National Environmental Policy Act and federal Clean Water Act by “improperly and intentionally excluding” Port MacKenzie as a “reasonable alternative” for the proposed LNG plant. Asserting a list of geographical advantages, the borough has noted that Port MacKenzie offers more developable land and is about 50 pipeline miles closer to Prudhoe Bay than Nikiski, which is farther south on the Kenai Peninsula. Building at the port also would eliminate the need for 27 miles of underwater pipe across Cook Inlet to Nikiski. The borough has long promoted its money-losing port for the LNG project and other industrial developments, with little success. Nikiski emerged as the preferred alternative among more than two dozen options in October 2013, when North Slope oil and gas producers ExxonMobil, BP and ConocoPhillips were leading the venture. The state took 100 percent control of the project in late 2016 after the companies declined to proceed with spending hundreds of millions of dollars on additional engineering, design and permit applications. The state applied to FERC in April 2017. The Matanuska-Susitna Borough, the Kenai Peninsula Borough (defending its community, Nikiski), and the City of Valdez (also promoting its community as the best location for the LNG plant), have all signed on as intervenors in the project’s application at FERC. Intervenor status does not bestow any special privileges or additional consideration in preparation of the EIS. The only significant difference between an intervenor and anyone else submitting comments to the docket is that only an intervenor can challenge a FERC decision in court. The Mat-Su and Kenai boroughs and AGDC are each paying different Washington, D.C., law firms with experience in FERC issues. If FERC stays with its self-imposed timeline of the draft EIS in February — no specific date set — it is scheduled to release its final EIS in November 2019, assuming it encounters no roadblocks or delays during the public comment period for the draft and assuming AGDC submits all the information requested by federal regulators. The state team has said it will be September before it can answer all of FERC’s questions about the Cook Inlet pipeline crossing. Regardless whether the project can stay on schedule with its FERC review, AGDC lacks funding to go past the past EIS. The new administration of Alaska Gov. Michael J. Dunleavy has said it is time “to re-engage the Legislature” and talk with the North Slope producers. This is a “great opportunity to pause and see where we’re at,” Revenue Commissioner Bruce Tangeman said at the Alaska Support Industry Alliance annual Meet Alaska conference in Anchorage on Jan. 18. Absent any partners, the state has been paying 100 percent of the costs since the producers left two years ago. Among its objections to AGDC’s analysis, the Matanuska-Susitna Borough contends that the state development team did not accurately map out and consider the “optimum site” proposed by the borough. “It appears that AGDC is justifying its preference for Nikiski over Port MacKenzie not based on technical feasibility and environmental impacts, but rather simply because AGDC has already completed design work for Nikiski but not Port MacKenzie,” the borough filing states. The North Slope producers, before they left the project and AGDC since then, have consistently pointed to problems with the Port MacKenzie location, including stronger tidal currents and tidal ranges, more winter ice hampering operations, a narrower channel for vessel traffic, conflicts with other potential users at the port, and the significant regulatory problems of operating in critical habitat waters of the endangered Beluga whales. In a separate issue for the EIS, the state project team on Jan. 23 submitted hundreds of pages of data, maps, charts and tables to FERC, responding to questions from the U.S. Army Corps of Engineers about the project’s effects on wetlands. • AGDC reported the project would permanently impact 10,412 acres of wetlands during construction, with an additional 8,731 acres temporarily affected during the work. About 3,500 acres would be impacted during project operations. The acreage includes the 62-mile pipeline from the Port Thomson gas field to the gas treatment plant at Prudhoe Bay, the gas plant, the 807-mile pipeline from Prudhoe to Nikiski, and the LNG facility and marine terminal. The Jan. 23 filing includes a detailed list of the wetlands locations. • Additional information on AGDC’s plans for digging the trench and laying the pipe in wetlands, including protection and restoration plans. • AGDC expects to provide a draft wetlands mitigation plan in the second quarter of 2019. 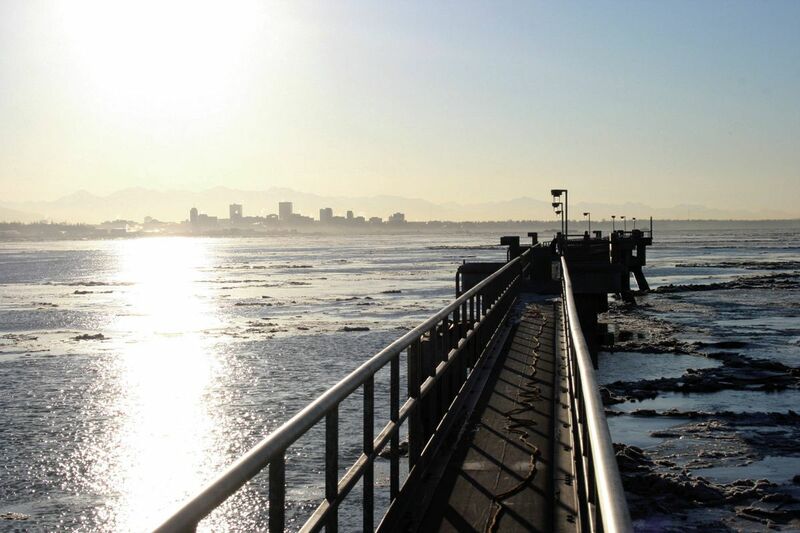 • Additional details on dredging 800,000 cubic yards from Cook Inlet to accommodate vessel traffic at the barge landing and freight dock that would be used for construction in Nikiski. The dredged material would be dumped at approved sites in deeper water. • Clarification that while AGDC proposes pipe-coating and double-jointing pipeline yards in Fairbanks and Wasilla, it has dropped plans for a similar yard in Seward. • AGDC reported it does not have plans at this time for any additional gas offtake points along the pipeline for local distribution other than the previously disclosed offtake points in Fairbanks, the Matanuska-Susitna Borough and Nikiski. Though AGDC has long touted the availability of gas for local use from at least five offtake points, it has not publicly identified any additional economically feasible connection points. Larry Persily is a longtime Alaska journalist, with breaks for federal, state and municipal jobs in oil and gas and taxes, including deputy commissioner of the Alaska Department of Revenue 1999-2003.